It’s what we all want to know. Is it possible to time the real estate market? If so, how do we pinpoint the best times to invest and sell? 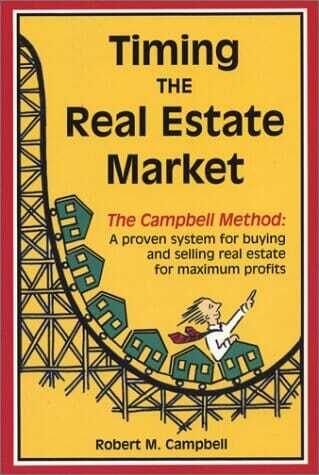 Robert ‘Bob’ Campbell was born into real estate. Over the last 70 years he has developed, and proven a system for timing the real estate market. We caught up with Robert Campbell live for this episode of the DistressedPro Professional Podcast to learn about his real estate timing methodology. Some don’t believe it is possible to time the market. The vast majority are very, very bad at it. Robert Campbell says it is possible. Campbell grew up with a father in the home building business. He lived and breathed real estate every day, and spent 10 years as a spec builder himself. He holds a degree in Economics from UCLA, and a MBA in real estate finance from the University of San Diego. After graduating he dived into investing with an apartment building, and made a solid profit in the first year. Yet, after making a mistake of his own, Robert dug into the data to figure out real estate’s cyclical nature. He pioneered the ‘Campbell Method’, which has been taught at the University of San Diego. Contrary to those which promote buying and holding real estate (or stocks) forever, Campbell thinks it is smartest to buy low, and sell high. What most miss is that the downside losses are so great that it can take them 5, 15, or half a lifetime to recover from. They sell out too late, and get in way too late. Even the cash flow they may get by holding on in between pales in comparison to taking a 40% or 50% hit to asset and portfolio value. So, how can investors more accurately time the real estate market, and know when the best times to buy and sell are? Get access to all this and more by listening in or downloading the transcript of the interview. Plus, discover where to get the book that made Robert Campbell famous, where you can catch him live, and how to get The Campbell Real Estate Timing Newsletter, which has been guiding savvy investors for the last 15 years. Get Robert’s Real Estate Timing Book Now. I wish I had this info in 2006 the San Bernardino mkt drop 46% and I lost my equities by 2008. If there is a fine line between insanity and genius Mr Campbell is an example of that. Great content though, thanks Brecht!